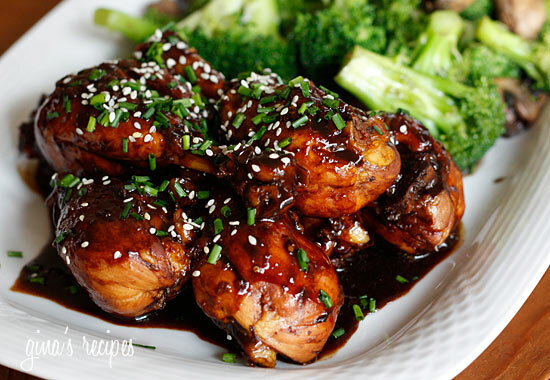 These Asian inspired drumsticks are finger lickin’ good! It’s hard to believe they are low in points (my husband kept asking me if they were WW friendly as he cleaned the bones!) The glaze would also be great with thighs or wings. I served this with steamed vegetables to make this a complete low fat meal and drizzled the remaining glaze over the vegetables. Also would be wonderful over rice. 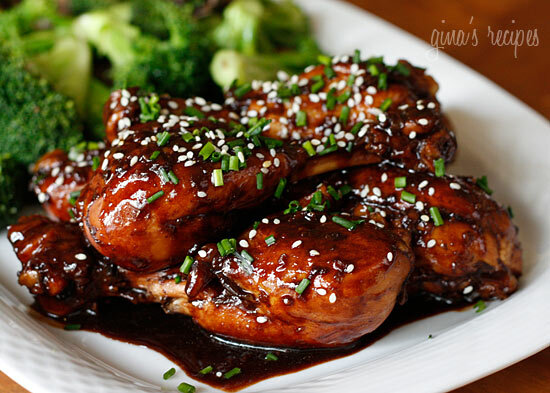 Thighs would also work great in this recipe, but chicken breast would get too tough. If you must, remove chicken breast after 15 minutes, then allow the sauce to reduce down. (the one with the rooster on the bottle)? This stuff is very addicting!! I think it may one day be as popular as ketchup! This spicy Thai chili sauce is available in many stores including Walmart these days, but if they don’t sell it near you, you can buy it online. In a heavy large saucepan, brown chicken on high for 3-4 minutes with a little spray oil. Add water, balsamic, soy sauce, honey, garlic, ginger, hot sauce and cook on high until liquid comes to a boil. Reduce heat to low and simmer, covered for about 20 minutes. Remove cover and bring heat to high, allowing sauce to reduce down, about 8-10 minutes, until it becomes thick, turning chicken occasionally. (Keep an eye on glaze, you don’t want it to burn when it start becoming thick). Transfer chicken to a platter and pour sauce on top. 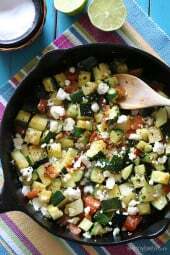 Top with chives and sesame seeds and serve. Do you know the calorie count for the glaze? Sorry don’t have that handy! 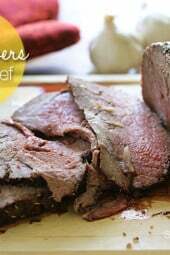 Have you tested this one in the instant pot? Would love a faster version – these are our favorite!! My husband and I loved this recipe along with the cauliflower “fried rice”…so good! Can you do a video of this one? This recipe was such a hit at my house that my daughter asked me to make it again the next day, only this time enough for leftovers! We ate it for 3 days! So yummy! We used boneless skinless thighs and it worked great! We will definitely be adding this to our rotation! 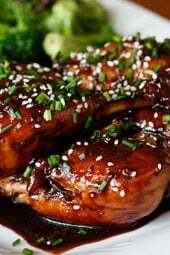 Just read your comment about the asian glazed drumsticks and how it took a long time to get the glaze to thicken. Made this tonight, and it was a huge success. My 5 year old cleaned his plate and asked for seconds – that NEVER happens. He declared it his favorite dinner. He made me promise to make it again. I had to take the chicken out of the sauce in order to get it to reduce, but it only took a few minutes. Highly recommend. 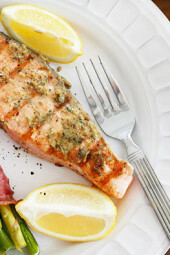 We love this recipe, but always have trouble getting the sauce to cook down to a glaze. It takes a long time, and the chicken has to come out way before the sauce is done. This time I’m doing it a bit different. I browned my chicken last night, using boneless skinless thighs. Now I’m cooking the sauce somewhat before adding the partially cooked Chicken..hoping that this helps. But the flavors are wonderful. I serve with brown rice and veggies. Makes a great dinner!